Pro golfer, Rory McIlroy, is set to play for Ireland in the Rio 2016 Olympics. According to Yahoo News, McIlroy, who was born and raised in Holywood in County Down, was eligible for both Great Britain and Ireland. 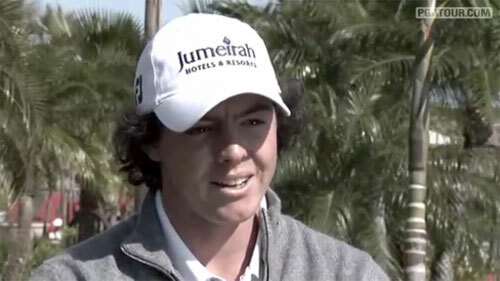 Photo shows Rory McIlroy speaking in a 2009 PGATour.com video segment. McIlroy had competed for Ireland at youth events, twice in the Golf World Cup and was heavily supported in his teenage years by the Golfing Union of Ireland. Pro golfer Graeme McDowell a fellow Northern Irishman who plays on both the PGA Tour and European Tour will also join McIlroy as part of Team Ireland. “On behalf of Team Ireland, I am thrilled to hear the great news that Rory has declared for the Irish Olympic team for the Rio Games,” Pat Hickey, president of the Olympic Council of Ireland said. Rory McIlroy won the 2011 U.S. Open, setting a record score of 16-under-par. He has been cited as the most exciting young prospect in golf and as having the potential to become one of the highest earners in sports in terms of endorsements. SportsPro has rated McIlroy as the second most marketable athlete in the world.